If you’re anything like me, when you hit your late twenties you became obsessed about the ingredients used in your day to day anti-aging skincare routine. In my case when I found “bad” alcohols (the ones that dry skin out), fillers or parabens listed on the back of skincare products I would freak out…just a little. Eventually, this led to a mass skincare product exodus with only a few worthy ones being left behind. Mind you this was during a period of my life where a less is more approach…inclusive of my anti-aging skincare products was the goal. 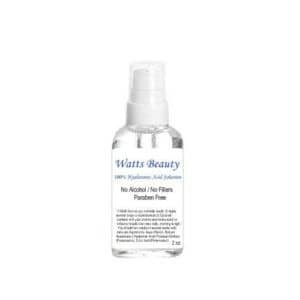 After crossing multiple Hyaluronic Acid serums off my list for having bad alcohols, too many fillers or being out of my limited budget, I found Watt’s Hyaluronic Acid solution. For those of you who don’t know, topical Hyaluronic acid is a humectant meaning it binds to water and with regular usage results in plumped up skin and a visible reduction of fine lines and wrinkles. Besides the simple nature, one of the other things I like about Watt’s Beauty’s formula is that it uses plant-based Hyaluronic acid instead of the type derived from animals (often Rooster Combs). Make sure to check out our guide if you’re looking to learn more about anti-aging benefits of serums inclusive of how they work and what they actually do.